AT KA&CO WE KNOW…THE MARKET. …or at least it has expanded to include the entire GLOBAL MARKET. FACTS: America is the largest investor into the Philippines national economy. Thousands of American or other global brands are thriving in the new emerging consumer economy. More than 500,000 Americans, as well as, the world’s largest American Embassy call the Philippines home. The Power of 50-Times Earnings is real: it allows you to invest, live, tour, outsource and/or retire early at a higher-level than in the West. Brands such as Mc Donald’s, 7/11, Kenny Rogers Roasters, FUBU, KFC, Coca Cola, Nestle, Hewlett Packard, Western Union and even The NBA have all re-invented, re-branded and re-launched as a 4-star brand –in the Philippines and Asia. It doesn’t matter whether you are looking for simple website, product distribution, office duty outsourcing solutions, real estate or cash flow investments in the tropics, fact is that you do more, with less cash –and less stress. LET’S GET STARTED! Our Founder, Lead Executives, and over 100 team members, photographers, writers, editors, IT Specialist and even stylists have ventured to, hosted events, product launches and lived in 1st, 2nd and 3rd world countries to do it. What is your goal? Let us help you achieve it. From The Shangri La, A-Class Resorts, in slums, rural provinces, we have dined and partied with, celebrated, talked, interviewed, gained data and unique understandings of nearly every minority culture in the world. We have received numerous awards, US Government Resolution, been first-to-the-market, re-branded and ultimately achieved success for thousands of clients, cities, ventures, politicians and countries. We have promoted more than 20,000 entrepreneurs, businesses, events and not-for-profit ventures around the world. From the idea, to the first logo, first AD, uniforms, location, training and even sale, we have worked with entrepreneurs to achieve their dreams and growth-goals. Though we are experts-in-the-field when it comes to the United States and Philippine Island social, consumer, social, business and product markets, we have launched ventures in Africa, Mexico, Saudi Arabia, as well as solely on the world-wide web. We have launched more than a dozen niche-market, market-specific, internationally distributed magazines, published more than 100,000 pages of press and media content, hosted sold-out Success Seminars, LIVE! ON THE SET Radio and TV Shows, video blogs, Icon interviews and product reviews. In addition, we’ve hosted thousands of consumers at more than 100 events around the world promoting anything from Remy Martin Cognac, to Cadillac, the Philippines country, minority America, political candidates, as well as global outsourcing. “My successes and -even more significant- my failures, give me an uncanny ability to see a bad deal or smell out a fruitless investment from miles away. Saving myself, my investors and my clients time and money…. We have worked with thousands of small and micro business entrepreneurs over the years. One thing we have learned is that simple and proper upgrades in marketing, PR, social and print media, can double their income and give them the free and higher esteem to go beyond their expectations. We one of Asia’s Top Beauty Suppliers came to us with their dream of implementing American-standards internally, going global and marketing to the world-wide beauty market we were excited. After initial consultation, product testing, R&D, press releases and market studies between Asian, American, Black and other ethnic consumers. We studied their brands, price points, created additional labels and product manuals, shot more than 100 product pictures, develop ethnic AD campaigns, applied SEO and wrote over 100,000 words of copy writing. Asia’s first American hosted on-line beauty store. Then, we developed and managed an alternate American-centric brand, sales and distribution platform which quickly garnered both a new local and global market share. FYI: Success Rate. The gross investment for the project venture was earned back in gross sales within 45-days of launch. In 2002, when 100 of the top NFP’s go together at the Ewing Marion Kauffman Foundation in Kansas City, MO for a crisis meeting after losing millions of dollars on US government funding do to a low ‘Success Rate’ by minority entrepreneurs they aimed to help, we were invited to sit-in -since our Founder, Kareem Jackson was one of their Alumni success stories. At this NFP Summit, we debuted what would become our signature marketing tool. We presented the first Test Market Cover; a dark skinned and a light-skinned hand shaking. After further development and promotion, the final cover was released, as well as 20,000 copies of the inaugural issue. The city Mayor Kay Barnes, and over 1,000 local celebrities, athletes, media, entrepreneurs and their supporters attended the Premier; over 2,000 attended the launch of the 2nd edition. The first Minority Success Magazine, interactive-events and EXPO. We subsequently were bestowed with the Ingram’s Masterpiece Award, S.C.O.R.E.S. National Entrepreneur of the Year Nominee and US Government Resolution for our contributions to Minority America. In an effort to end tattoo discrimination in the Philippines, we decided to launch Philippines INK; taking an aggressive, hands-on approach and launch a artist showcase and booking website, a winner-takes-all tattoo competition and a complimentary Philippines tattoo lovers magazine. MAKE IT HAPPEN. We spent nearly 1-year immersed in the Philippines underground tattoo lifestyle, culture and industry. As a test-market, we debuted one Philippines-based artist in The Philippines Magazine International as a half-page AD. Success…the AD gained an entirely new readership, as well as, proved beneficial for the artist. Later we released press releases and promotional videos, as well as social media campaign, to announce to ‘Coming Soon’ of a full-section dedicated to the Philippines tattoo industry. RAVE REVIEWS. After an amazingly rapid and warm welcome by the Philippines tattoo industry at-large, plus thousands of tattoo artists and tattoo lovers all around the world we released to the press our intentions to launch a complimentary, full Philippines INK International Tattoo Lifestyle, Tourism & Culture Magazine. We supported more than 100 underground events, competitions, parties, clubs and hotspots. Ultimately, launched the country’s largest tattoo directory, showcasing more than 500 Philippines and United States based tattoo events, artists, hot spots and shops. Our PH INK Master Tattoo Competition, was the Philippines first and only full on-line artists registration, promotion and showcase; unique geared towards tattoo collectors and lovers. The competitions ‘sold-out’ within the 1st week they were announced with nearly 300 total registered artists, around 75 finalists, Top 20 and 1 PH INK Master who has won both annual competition so far. We gave away nearly P100,000 in promotional prizes, advertising and perks to Philippines artists, reached more than 250,000 people with our magazine, social and print media, as well as 24 tattoo promotional videos and press releases. Philippines INK is one of the Top 2 most-popular local tattoo community magazines. It is the only complimentary, international Philippines tattoo promotional magazine in the world. In addition, it is the only Philippines tattoo artists booking website and the highest price competition; and the country’s first 1 winner-take-all competition. When the Filipina/British proprietors of Carasuchi Villa Gardens came to us with their unique vision for their former family mansion in the Philippines, we wasted no time in helping them to create, develop and expand their ‘Carasuchi Villa-Style Resort’ dream into a reality. Beginning with our unique KA&CO Venture Development Consulting and some R&D while still in the United States, then continuing once we arrived in the Philippines. Subsequently, developing the logos, slogans, branding, marketing materials, their first booking website, published print Ads, photography, massive SEO, business calling cards, resort and food photographer, virtual video tours, extensive printed –and digital- menus, more than 25,000 words of copy writing, a dozen press releases, The Philippines Magazine International ‘Best of the Philippines’ and Philippines INK Magazine endorsements, 2 magazine launch parties, local media coverage, on-site video blogs, event promotion and hosting, as well as additional 2 upgrades as their resort grew. For Anything from Philanthropy Tours where you live –safely- in the slums with some of the world’s happiest people. The experience will teach you how to appreciate and enjoy the simple things in life. Our VIP and Celebrity Tours in which you live poolside at world-class hotels and resorts, get facials, and perhaps some cosmetic surgery to return to the West vibrant, sure and full of vigor! Our controversial, but popular, Racism-Free Black & Minority American Tours are designed to be an eye-opening and life-altering experience as guest live without issues of race. The ultimate de-stressor and many live with subliminal and inherent stress related to their lifestyle in the West. KA&CO Philippines INK Tattoo Lover Tour is a trailblazer. It caters to the relatively new and emerging community of art lovers who seek to collect tattoos from Philippines-artists –they rank amongst the best in the world. Trips to ancient Mindanao tattoo artists are available. The ‘rasta’ and tattoo underground lifestyle is festive, fun-loving and inspiring to creatives. In this tour, you stay beachside, hosted by an artist in a resort or hotel near to a tattoo community. Guests are featured in our Philippines INK Tattoo Lifestyle Magazine. Plus! Wanna get a new tattoo? The tour INCLUDES a FULL-ARM, CHEST OR BACK Masterpiece Tattoo from one of our PH INK Master Artists. The Philippines is the world’s most hospitable culture, fastest growing economy, as well as, home to some of the world’s most-popular beaches and tropical resorts. When our magazine readers, fans, clients and potential clients need a vacation or full-out hiatus from their hustle-n-bustle, go-go-go Western lifestyle; but are not just looking to veg-out on the sofa, some cruise ship, stay stuck in a resort or just sit around the beach all day, we develop and host custom tours designed to return them to the West both RESTED & INSPIRED. Business People enjoy the relation and tranquility of the islands, along with expert insights of the opportunities which await –especially for micro-investors! Philanthropists and Social Entrepreneurs can enjoy any of our not-for-profit ventures or affiliates, or, they may decide to create their own! Either way, KA&CO can help you get on the right track. can enjoy amazing custom and hosted tour packages from Metro Manila, Mega Makati City, Private Beach Clubs, to Provincial and Beachside All-Inclusive Retreats –with and without WIFI. 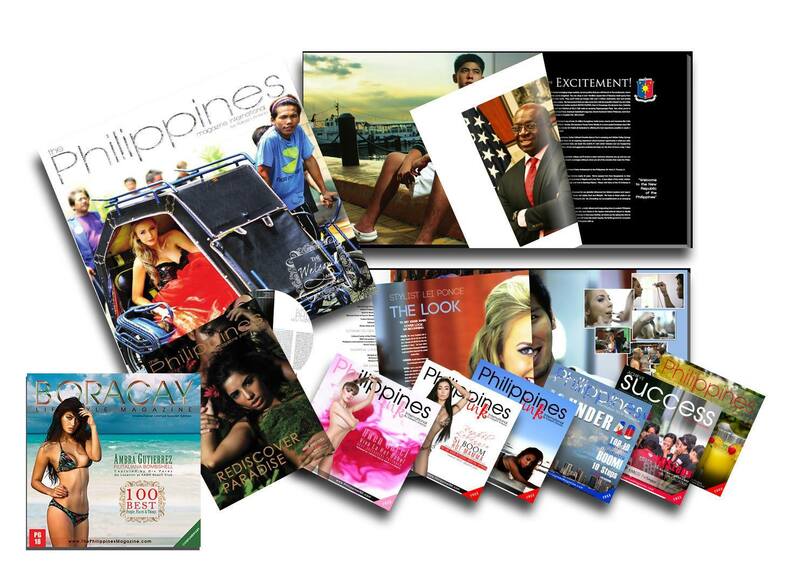 Being the US Executive Publishers of the only international Philippines true-lifestyle promotional magazine enable us to have relationships with hundreds of public, private and VIP tour guides, hotels, resorts, chefs, restaurants, airlines, livery and chauffer services, estates, event planners, even famous Filipino Tricycle and Jeepney owners! To Date: We have co-founded nearly a dozen philanthropic and social-entrepreneurship ventures contributing more than P 2.5 million into the local communities; served more than 5,000 meals, to over 1,000 individuals, children and families in need, given 2,000 backpacks and school supplies, hosted hundreds of college students in our real-life certification seminars and awarded 2 dozen student intern and scholarships. We are currently working with Philippines-based Orphanages to arm children with the life-skills and self-esteem to succeed in life, despite their adversities. In addition, we have awarded over P5 million in free advertising, to over 3,000 entrepreneurs and businesses, sponsored 2 dozen complimentary US and Philippines promotional magazines, hosted more than 10,000 guests at social-entrepreneurship events, showcased more than 500 Philippines and US-based artists, awarding more than P100,000 in cash and prizes. …THE PHILIPPINES ECONOMY IS STABILIZING AND GROWING.